Fungi (singular: fungus) are a kingdom of usually multicellular eukaryotic organisms that are heterotrophs (cannot make their own food) and have important roles in nutrient cycling in an ecosystem. Fungi reproduce both sexually and asexually, and they also have symbiotic associations with plants and bacteria. However, they are also responsible for some diseases in plants and animals. The study of fungi is known as mycology. Some fungi are single-celled, while others are multicellular. Single-celled fungi are called yeast. Some fungi alternate between single-celled yeast and multicellular forms depending on what stage of the life cycle they are in. Fungi cells have a nucleus and organelles, like plant and animal cells do. The cell walls of fungi contain chitin, which is a hard substance also found in the exoskeletons of insects and arthropods such as crustaceans. They do not contain cellulose, which commonly makes up plant cell walls. Multicellular fungi have many hyphae (singular: hypha), which are branching filaments. Hyphae have a tubular shape and are split into cell-like compartments by walls that are known as septa. These cells can have more than one nucleus, and nuclei and other organelles can move in between them. (There is some debate over whether multicellular fungi are truly multicellular, because organelles and cytoplasm can move from one cell to the other in a process called cytoplasmic streaming. They are commonly known as multicellular, but they are not multicellular in the same way as plants and animals, which have enclosed cells.) A fungus’s network of hyphae is called a mycelium. These are hyphae of a Penicillium fungus. Fungi are heterotrophs; they cannot make their own food and must obtain nutrients from organic material. To do so, they use their hyphae, which elongate and branch off rapidly, allowing the mycelium of the fungus to quickly increase in size. Some fungi hyphae even form root-like threads called rhizomorphs, which help tether the fungus to the substrate that it grows on while allowing it to quickly obtain more nutrients from other sources. Fungi are opportunists, which means that they can obtain nutrients from a wide variety of sources and thrive in a wide range of environmental conditions. Some fungi obtain nutrients from dead organic matter; these fungi are called saprobes and are decomposers, which break down and get rid of dead organisms. Other fungi parasitize plants and are responsible for plant diseases like Dutch elm disease. However, fungi can also have symbiotic (mutually beneficial) relationships with photosynthetic algae or bacteria, and with plant roots. A symbiotic association of a fungus and an animal that photosynthesizes is called a lichen, while a plant root-and-fungus association is called a mycorrhiza. Most fungi can reproduce through both sexual and asexual reproduction. Asexual reproduction occurs through the release of spores or through mycelial fragmentation, which is when the mycelium separates into multiple pieces that grow separately. In sexual reproduction, separate individuals fuse their hyphae together. The exact life cycle depends on the species, but generally multicellular fungi have a haploid stage (where they have one set of chromosomes), a diploid stage, and a dikaryotic stage where they have two sets of chromosomes but the sets remain separate. All fungi reproduce using spores. Spores are microscopic cells or groups of cells that disperse from their parent fungus, usually through wind or water. Spores can become dormant for a long time until conditions are favorable for growth. This is an adaptation for opportunism; with a sometimes unpredictable food source availability, spores can be dormant until they are able to colonize a new food source. Fungi produce spores through sexual and asexual reproduction. There are five phyla of fungi: Chytridiomycota, Zygomycota, Glomeromycota, Ascomycota, and Basidiomycota. The following is a brief description of each phylum. Chytrids, the organisms found in Chytridiomycota, are usually aquatic and microscopic. They are usually asexual, and produce spores that move around using flagella, small tail-like appendages. The chytrid Batrachochytrium dendrobatidis can cause a fungal infection in frogs by burrowing under their skin, and it has recently devastated populations of harlequin frogs, killing off two-thirds of them in Central and South America. Zygomycetes are mainly terrestrial and feed off of plant detritus or decaying animal material. They also cause problems by growing on human food sources. One example of a zygomycte is Rhizopus stolonifer, a bread mold. The hyphae of zygomycetes are not separated by septa, making their mycelia essentially one large cell with many nuclei. They usually reproduce asexually, through spores. Glomeromycetes make up half of all fungi found in soil, and they often form mycorrhizae with plants; in fact, 80-90 percent of all land plants develop mycorrhizae with glomeromycetes. The fungi obtain sugars from the plant, and in return, dissolve minerals in the soil to provide the plant with nutrients. These fungi also reproduce asexually. Ascomycetes are often pathogens of plants and animals, including humans, in which they are responsible for infections like athlete’s foot, ringworm, and ergotism, which causes vomiting, convulsions, hallucinations, and sometimes even death. However, some ascomycetes normally are found inside humans, such as Candida albicans, a yeast which lives in the respiratory, gastrointestinal, and female reproductive tracts. Ascomycetes have reproductive sacs known as asci, which produce sexual spores, but they also reproduce asexually. Like ascomycetes, basidiomycetes also produce sexual spores called basidiospores in cells called basidia. Basidia are usually club-shaped, and basidiomycetes are also known as club fungi. Most basidiocytes reproduce sexually. Mushrooms are a common example of basidiomycetes. Fungi are sometimes overlooked in biology, especially compared to bacteria, plants and animals. This is partially because many fungi are microscopic, and the field of mycology did not really develop until after the invention of the microscope. However, there are many common examples of fungi. Yeasts are one example. As mentioned before, Candida albicans grows naturally inside the human body, but sometimes it can grow excessively and cause a yeast infection. Yeast infections are extremely common; 75 percent of women will have at least one yeast infection during their lifetime. Fungi are also often associated with food. Mushrooms and truffles are examples of fungi that are sometimes edible, the latter being highly prized in haute cuisine internationally. Molds are fungi that grow on foods over time, causing them to spoil. Food is refrigerated in order to prevent mold growth since few molds grow at 4°C (39°F). However, some molds are used in the process of cheese-making. Molds are added to soft ripened cheeses like brie, washed rind cheeses like Limburger, and blue cheeses. Heterotroph – An organism that cannot make its own food and must obtain nutrients from other organic sources. 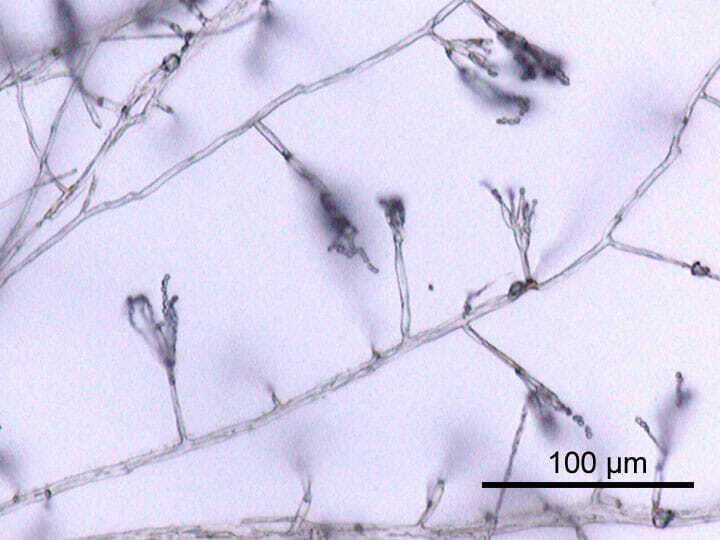 Hyphae – Branching filaments of a fungus. Mycelium – A network of hyphae. 1. Which of these is NOT a fungus? C is correct. Algae are not fungi, but photosynthetic algae can form symbiotic relationships with fungi. A fungus and photosynthetic organism are collectively called a lichen. 2. What is a mycorrhiza? C is correct. Mycorrhizae are associations of plant roots and fungi. The plants and fungi have a symbiotic relationship and each provides nutrients for the other; fungi take sugars from the plant, and they break down nutrients in the soil so that the plant can uptake them. 3. Which fungi have greatly reduced populations of harlequin frogs? A is correct. Chytrids, specifically Batrachochytrium dendrobatidis, has caused fungal infections in large numbers of harlequin frogs. This has reduced their numbers in Central and South America by two-thirds.